On 8 May 1563, Bishop Magnus of Oesel-Wiek and Courland granted the Riga civic charter to Arensburg, today’s Kuressaare, at his Piltene residence. Magnus’s privilege granted to the citizens the right to set up leading bodies of the city, to administer civilian and criminal law and carry out local government functions. The charter protected monetary rights of the citizens, regulated terms of trading and issues of welfare of the city. 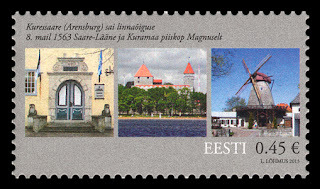 Functioning on the basis of the Riga Charter, the local government was clearly different from the other parts of the island of Saaremaa, then known as Oesel. The day of granting the charter is marked as the birthday of Kuressaare, although the settlement was mentioned for the first time as early as in 1424.